We at Mountain Tiger Society provide recreation and community safety skills for adults and teens with developmental disabilities. 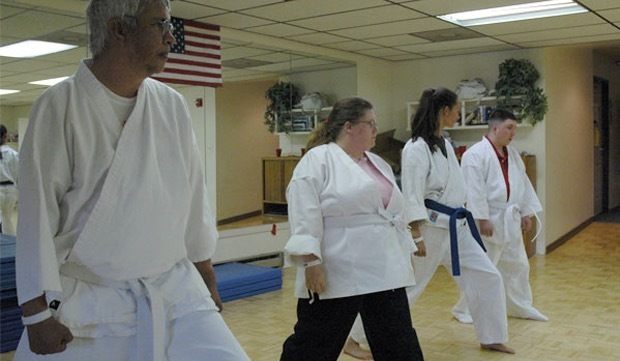 Through the martial arts, we offer physical benefits including exercise and coordination. Perhaps more importantly we offer many psychological benefits. Students develop meaningful social connections, a sense of belonging, situational awareness, and verbal skills for avoiding problems in the community. Most importantly, we have fun while gaining the benefits of an appropriately-paced martial arts curriculum. By most estimates, individuals with developmental disabilities are ten times likelier than the general population to become victims of abuse, crime, or sexual assault. Our classes include role-playing exercises so students can practice navigating challenging situations. Students also develop confidence and self-mastery through periodic demonstrations and tests. It is the goal of Mountain Tiger Society to become not merely a martial arts school, but a source of strength, pride, and belonging for each and every student. All of our weekly classes begin with that goal in mind. If you are interested in establishing a similar program, please contact Sensei Mark Nothdurft at info@mountaintiger.org. Sensei Mark Nothdurft has studied and taught martial arts for more than 40 years. He holds black belts in aikido, yawara, karate, and jujitsu. He is one of only two people in Colorado authorized by Master Gene Chen to teach Chen’s style tai chi. Mark also teaches jujitsu and children’s karate at Yama Arashi Ryu. Shawn Smith, Psy.D. is on the board of directors for Mountain Tiger Society and an occasional assistant instructor. Shawn has been active in the local martial arts community for more than 30 years. Shawn is a psychologist in private practice in Wheat Ridge. Our helpers: Most of our classes include helpers who are family, caregivers, facility staff members, and other volunteers. Our helpers make our job much, much easier, and they are all valuable members of our team! Here are a few of the kind words we’ve received from folks over the years. Our developmentally disabled clients from the Nostalgia Group here in Denver have noticeably grown since attending martial arts instruction under your guidance. Your kind of training is sorely overlooked for our friends that truly need a way to protect themselves from harms way. The discipline, balance and agility for the disabled threat your school teaches will last them a lifetime and may very well save them from a bad situation or injury in the future. My clients’ confidence has matured and they have more control over their bodies with the exercise during your lessons. I realize that your mission is unique and I am thankful for the exceptional opportunity that you offer to the participants to our day program. Please, anyone who is a parent or counselor, who can make the decision to involve people with disabilities in the martial arts should do so as soon as possible. – George L. Brangoccio Jr.